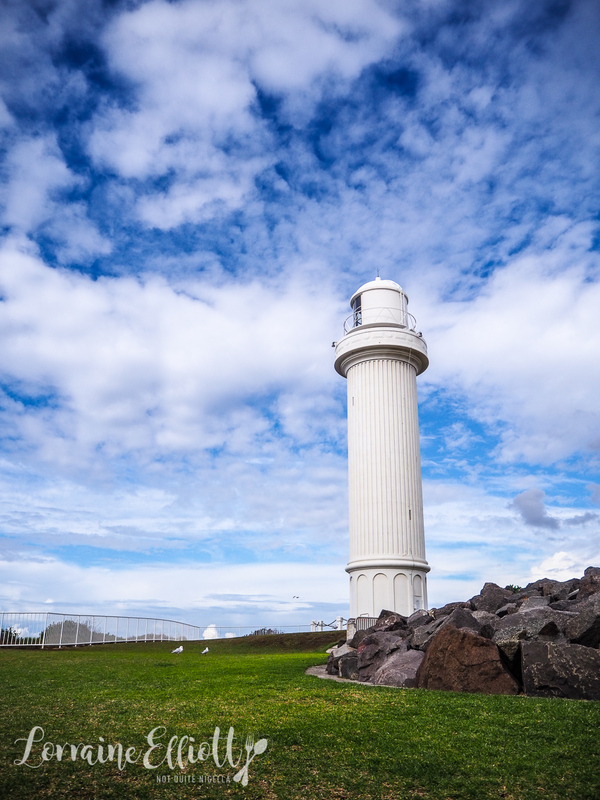 It's a fine day for a drive down to the South Coast of NSW. 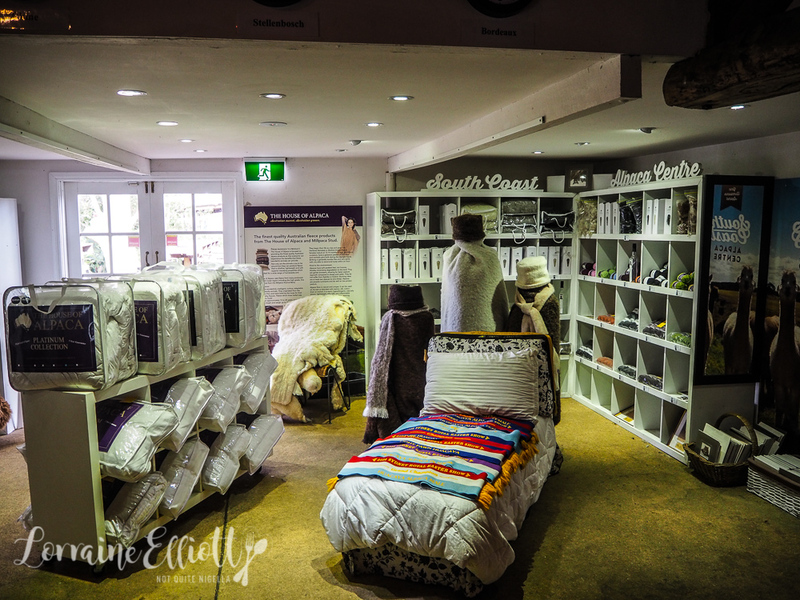 We feast on delicious toasties, rainbow bowls, halloumi donuts, do some wine tasting and pat alpacas and stay at a stunning converted "shed" while we sample the best that the South Coast of NSW has to offer! Long time readers will know that I only recently got my license and my immediate environment means that I am more a city than a country driver. I am more comfortable in gridlock than on a highway. 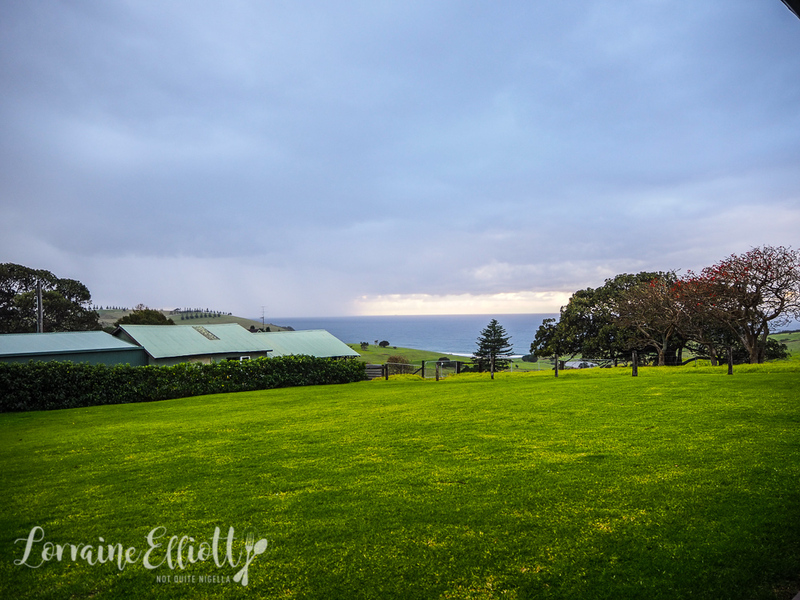 So when Mr NQN told me that he wouldn't be able to drive down to Kiama with me on the first day of our trip, I took a sharp intake of breath. It would be just me, on the road in a rental car driving to the south coast and he would join me that evening. Luckily I had stops in the form of food breaks. 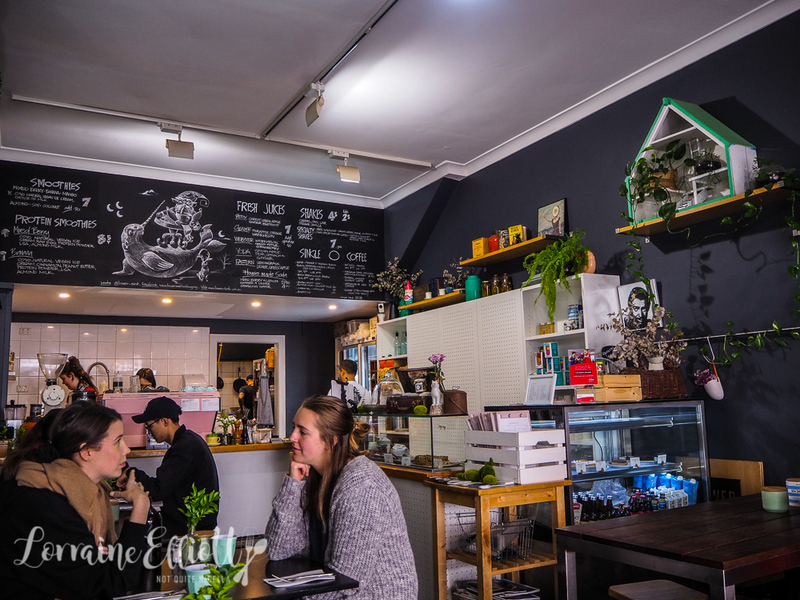 One and a half hours into the drive I stop in Wollongong's Lower East Cafe. 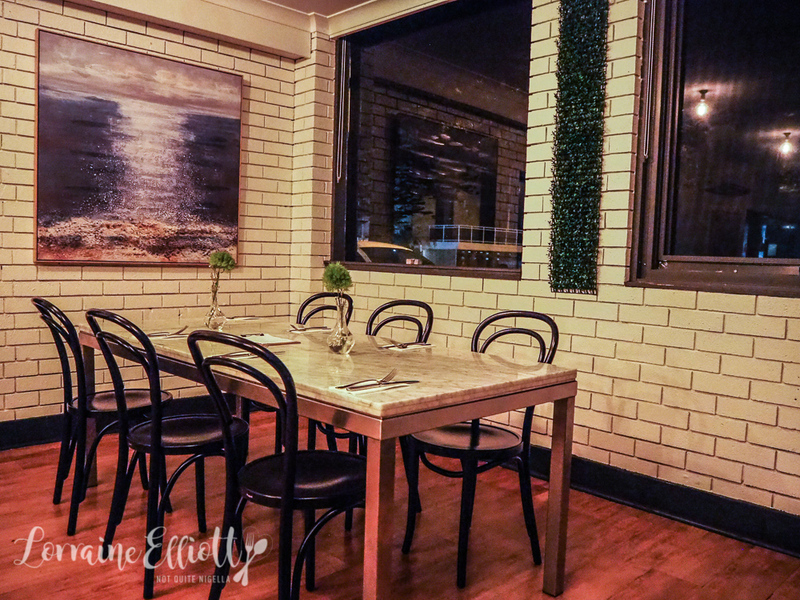 Located on Crown Street in Wollongong's CBD it is a very popular place with only a couple of tables free at lunch. Service is very friendly and easy going and nothing is too much trouble. 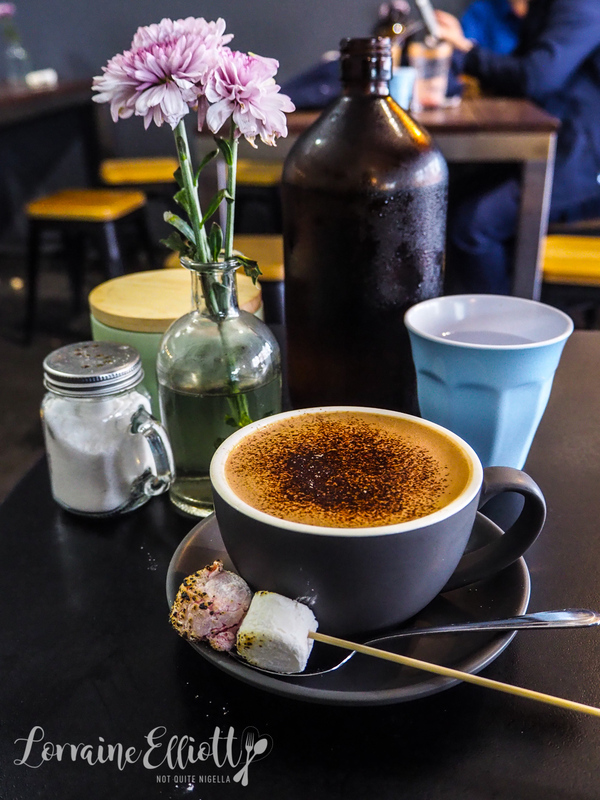 It's a gorgeous sunny day but I'm feeling all about a hot chocolate-specifically their stove top salted caramel hot chocolate with almonds that comes with two toasted marshmallows. Can I just request that all hot chocolate marshmallows come toasted? They increase the appeal of a marshmallow a thousand times over. It just happens to be national toastie day on the day of my visit so I feel like my choice for the beef brisket toastie was pre-ordained. 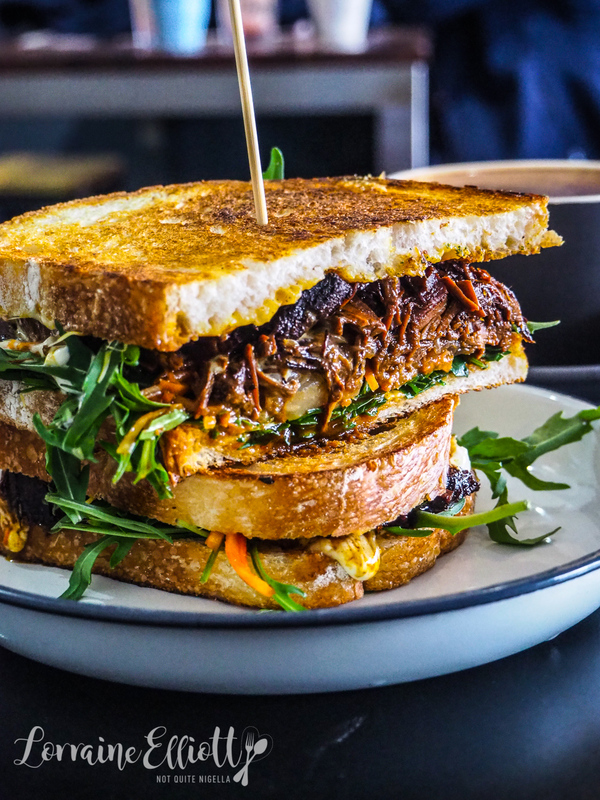 It's a beauty-with plenty of soft, melting beef brisket, kimchi, cheddar cheese, onion jam, aioli and rocket on sourdough it's the sort of thing that you say you'll just eat half of - before of course demolishing it all. I also take a banana smoothie to go because I need sustenance for the road (honestly the way I carry on you'd think I was an athlete or drama queen or something). It's just another 60 minutes (50 if you actually listen to the GPS and stop singing Bohemian Rhapsody long enough to pay attention to the directions) to my next stop in Gerroa. 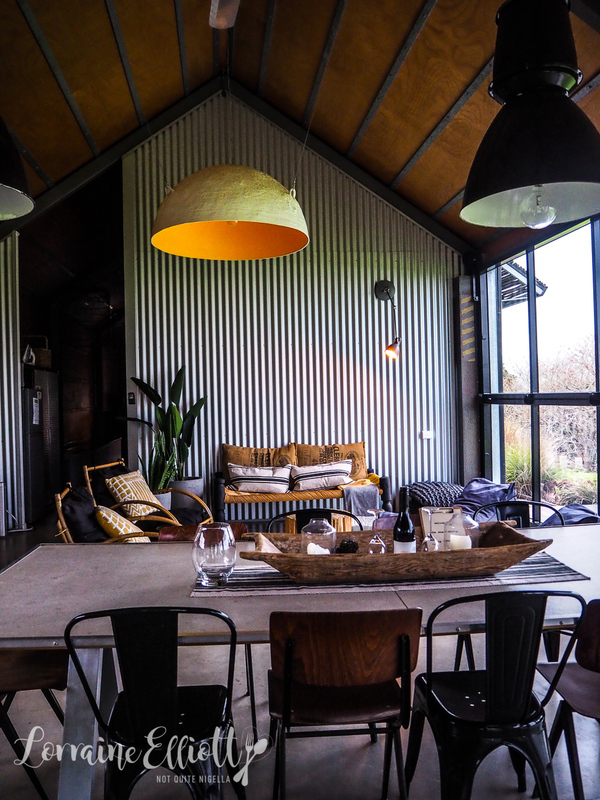 Blue Swimmer restaurant is a gorgeous little cottage housing a restaurant where Canadian born chef Lauren Brown makes use of the abundant local produce. I meet Karen for lunch. 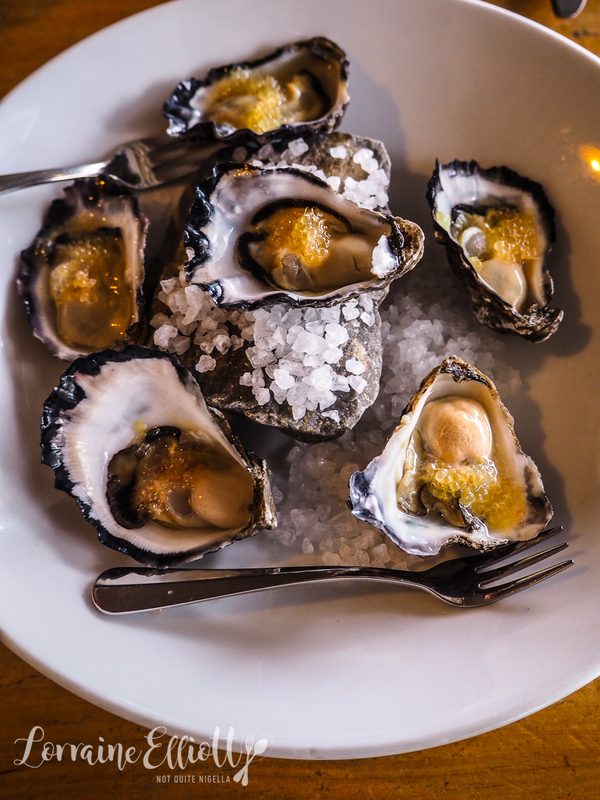 The Clyde River oysters are local and when she brings out the plate she tells us that the finger limes are just from across the road. They give the oysters a puckery pop. 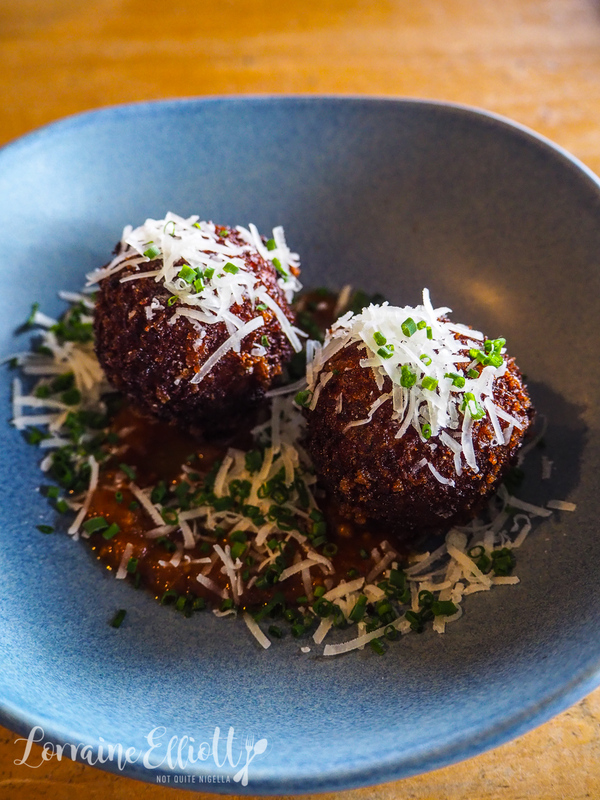 I love croquettes and these come two to a serve. They're filled with parmesan cheese and speck and sit atop some spiced kasundi sauce. They actually sell this sauce as well as house made jams in the cafe too. 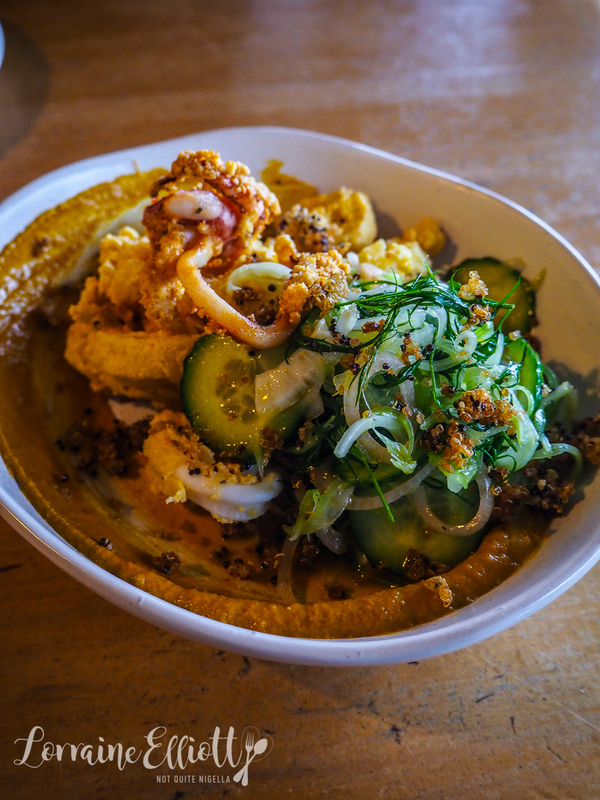 The crispy squid comes with a lovely cucumber, celery and dill salad, crunchy quinoa and a smear of spicy bomba, a spicy Calabrian red pepper spread. The breading on the squid remains crunchy which is good. But it's the smoked pumpkin salad that most wins my heart. 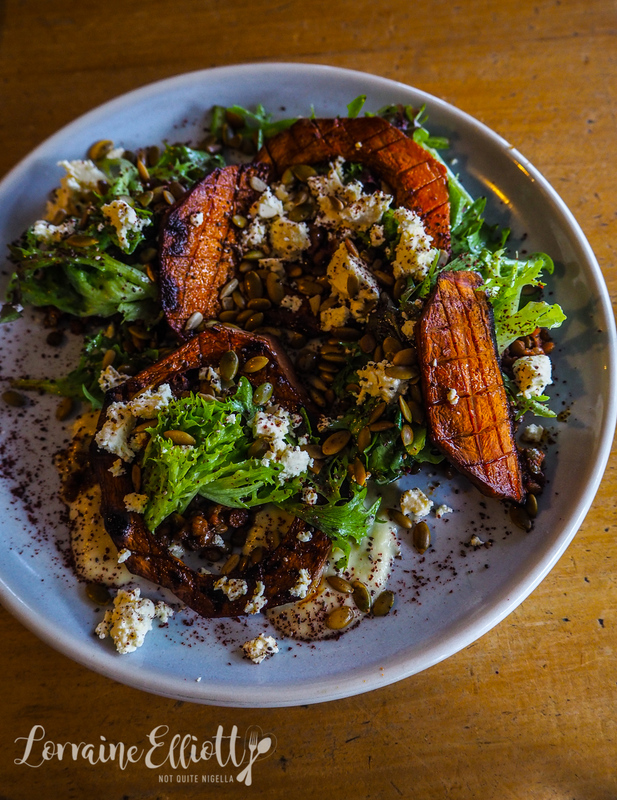 With slices of house smoked local pumpkin it is served with crunchy pepitas, pumpkin seeds, feta, sweet onion puree as well as spiced lentils that give the dish heft. It's dessert time. 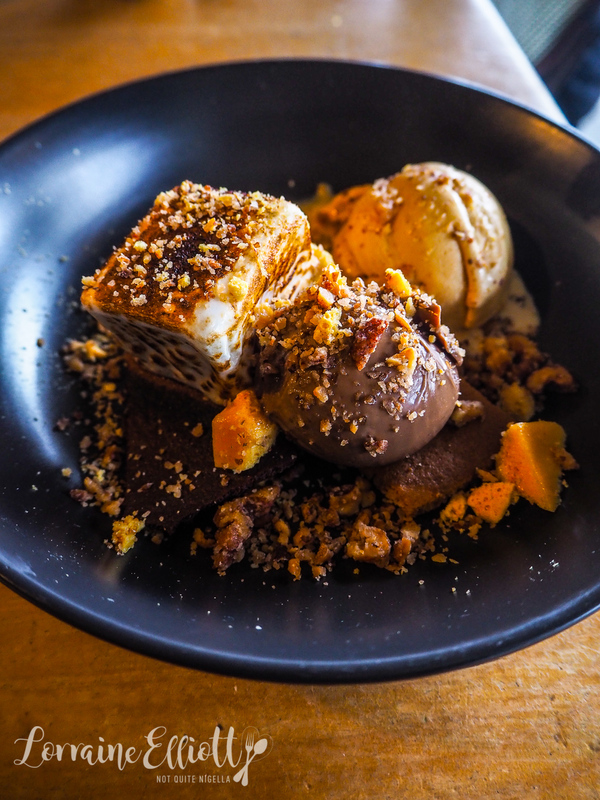 The rocky road here is an upmarket version with chocolate pudding mousse, a house-made torched marshmallow, salted caramel ice cream and honeycomb. It's all sorts of textures in one and their recipe for this appears in the local Illawarra cookbook. But hands down one of my favourite eats this whole weekend and a revelation are the halloumi donuts. The halloumi is grated in it and although you may think it would produce a chewy or squeaky texture, it is light as a feather in the same manner of ricotta. 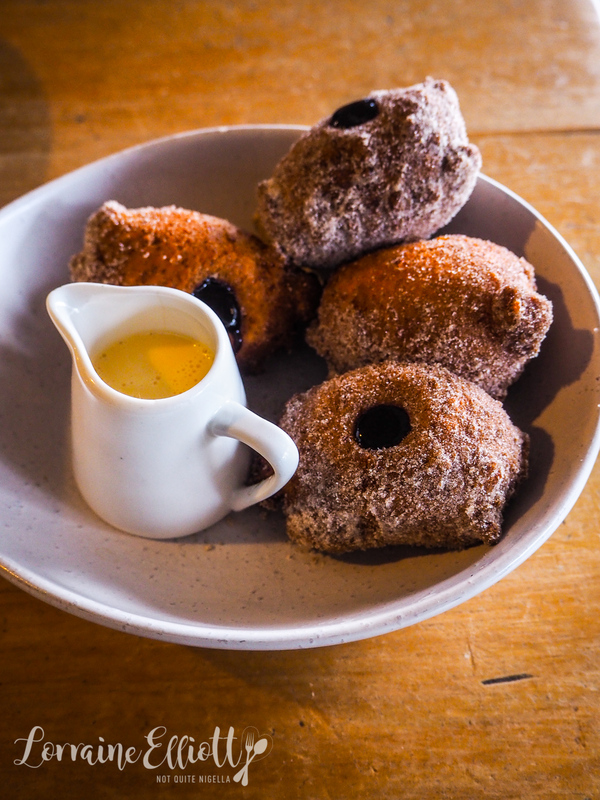 There is a squeeze of blueberry jam and a pot of creme anglaise accompanying the four cinnamon sugar rolled beauties. And Lauren kindly sent me the recipe for her halloumi donuts. 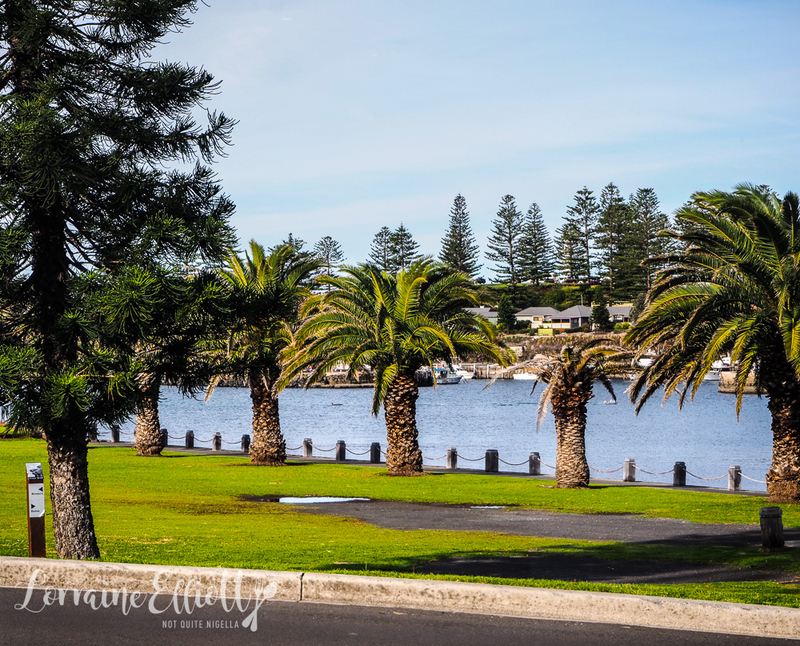 My next stop is our home for our South Coast stay. 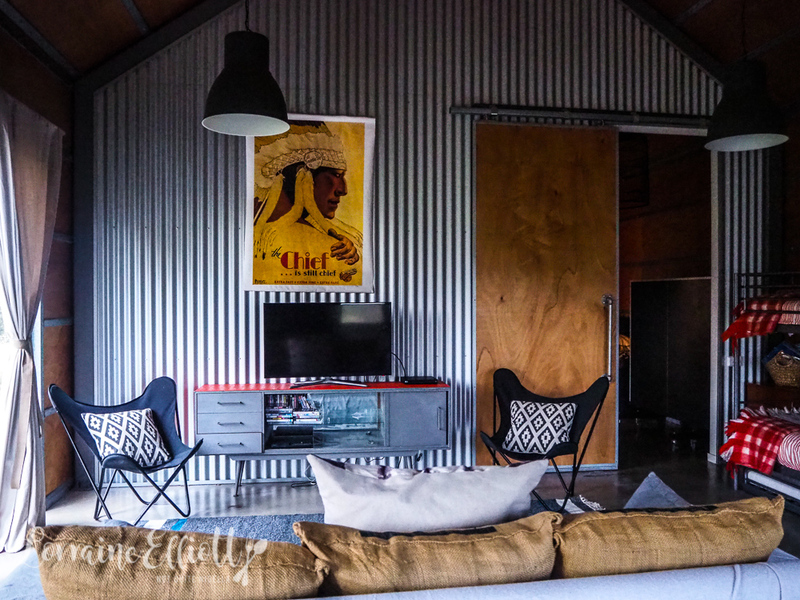 The Shed is a converted shed whose name belies the spacious and comfortable accommodation. 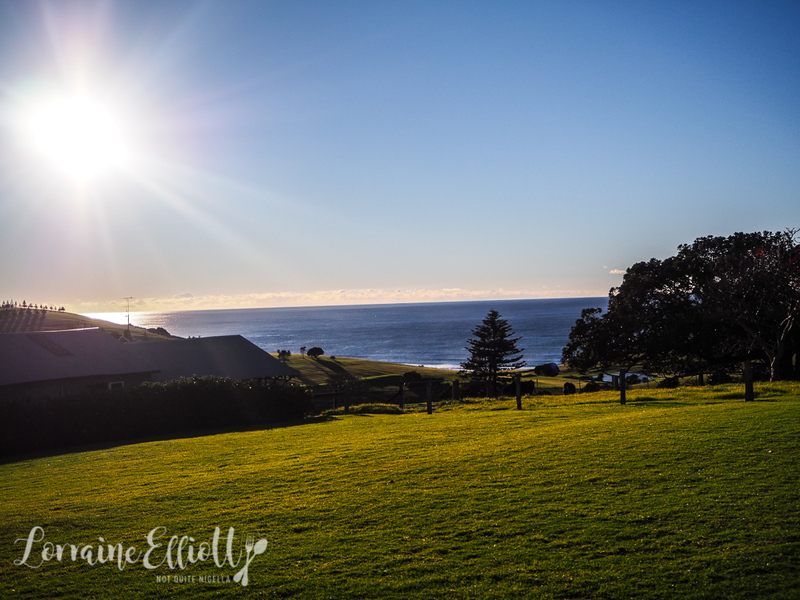 For starters the views are immaculate - across Walker's Bay there is a row of pine trees that line up like soldiers across the horizon while the green rolling hills and blue skies giving both farm and water views. 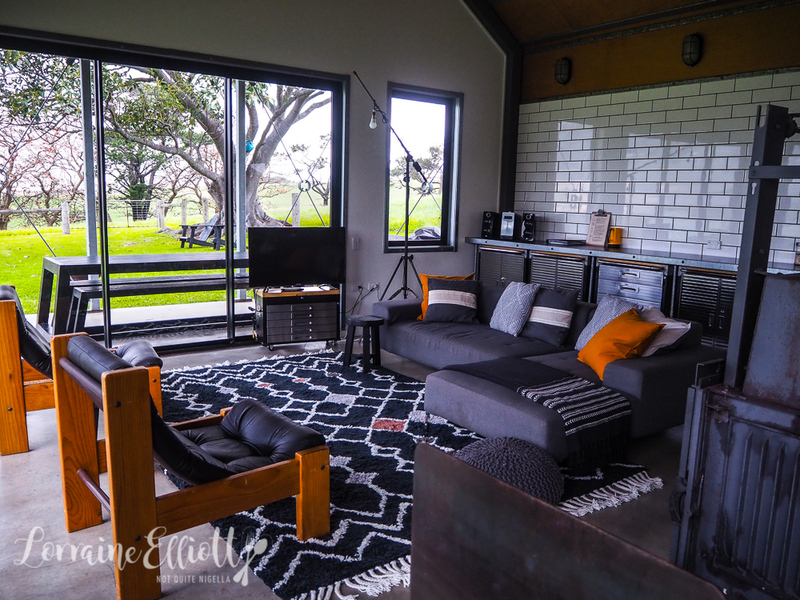 The accommodation makes the most of the views from the enormous glass windows, five and a half metre ceilings and polished concrete floors with stylish soft furnishings. 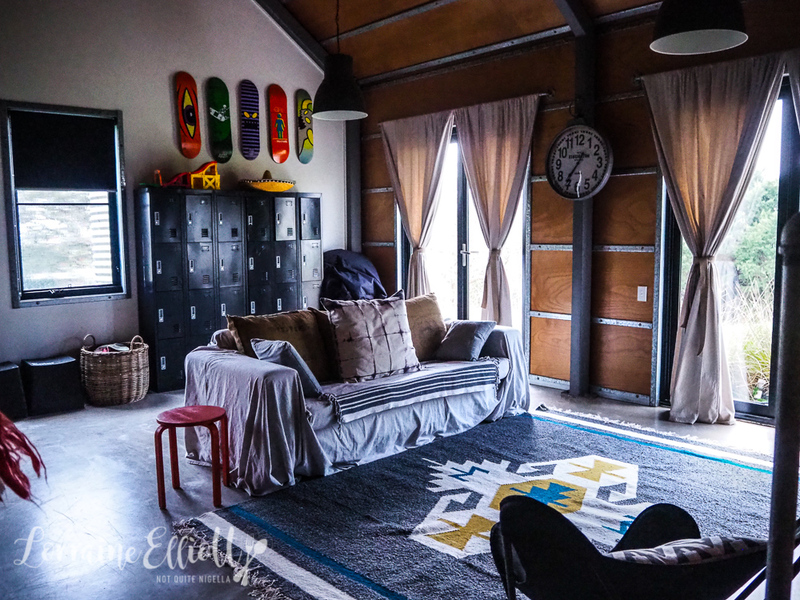 There are three bedrooms here, two for adults and one for up to four children with four bunk beds and an enormous rumpus room complete with toys and costumes for dress ups. I mean being a kid nowadays has infinitely more options than it did in the 80s and 90s. 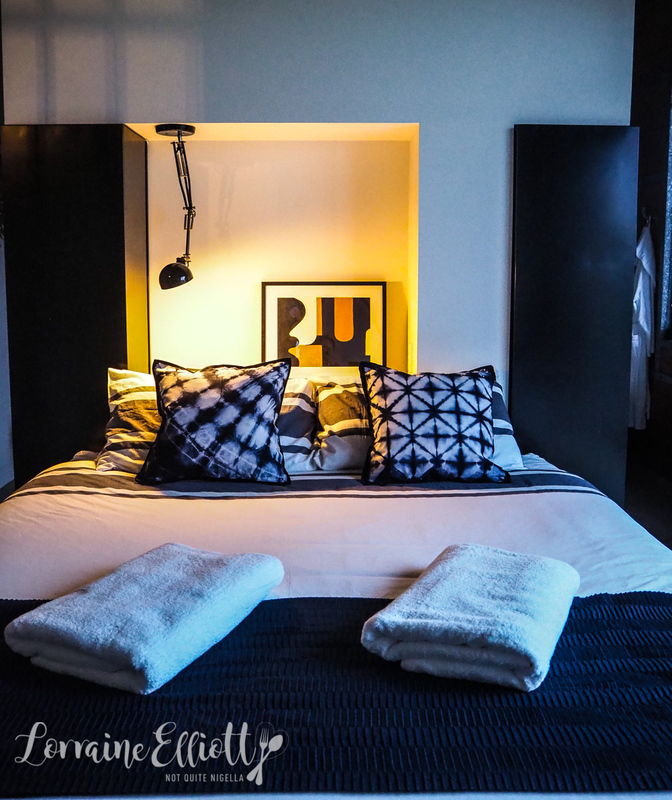 The main bedroom has a king bed and an ensuite. 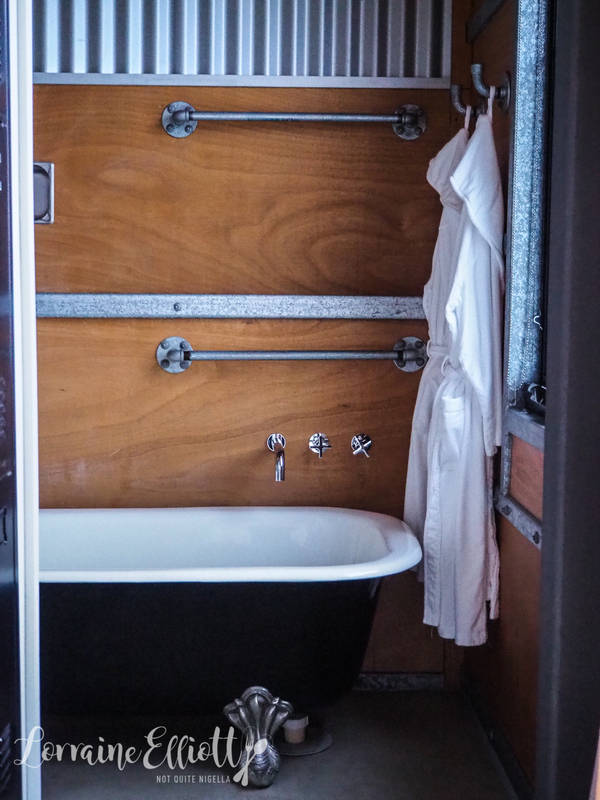 There's a claw foot bath in one corner (although oddly the plug doesn't fit the tub), snuggly robes and an open shower. There are also cute features like plenty of locker space. 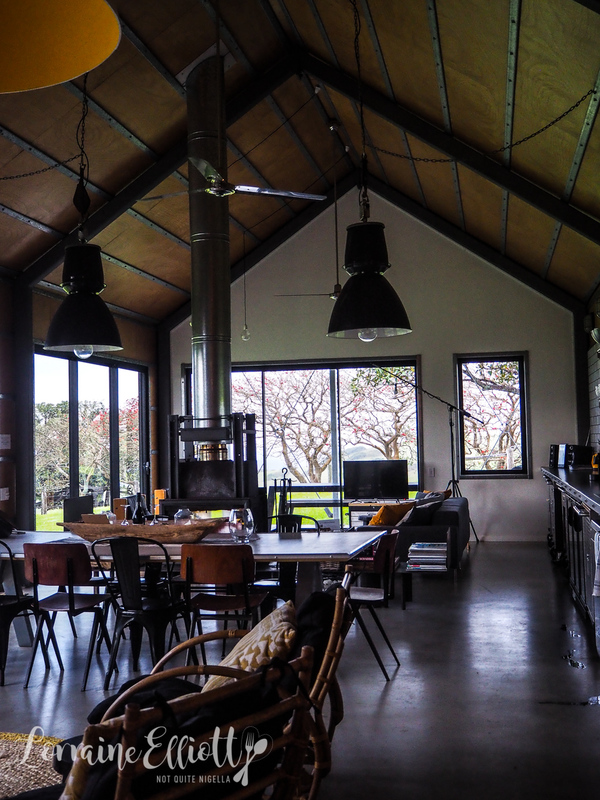 Each bedroom has an oil heater and there's also one in the main lounge/kitchen. There's also a fireplace which I do my best to get started. My first fire lasts a total of 10 minutes before being reduced to billows of smoke and ashes. My second fire is more successful thankfully (I believe a lot of it is about log placement). There is no wifi (it is TBA) and it isn't the sort of place for a luxurious sleep in as the sun powers through the curtains very early in the morning. 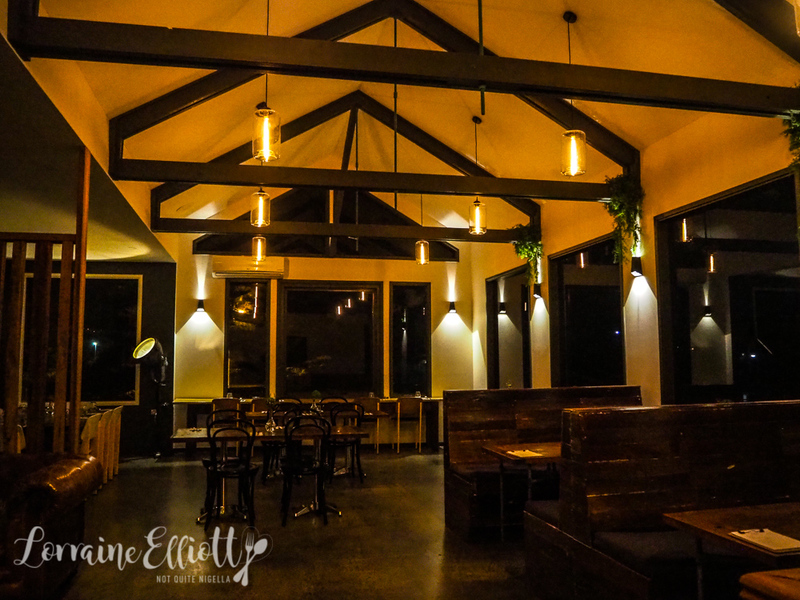 That evening Mr NQN arrives and we take the drive to Kiama to check out a new restaurant Silica. During the day there are gorgeous views of the beach although at night you can't really see them. Upstairs is a bit more atmospheric than downstairs. It also happens to be pasta night tonight so we try a dish from the menu. 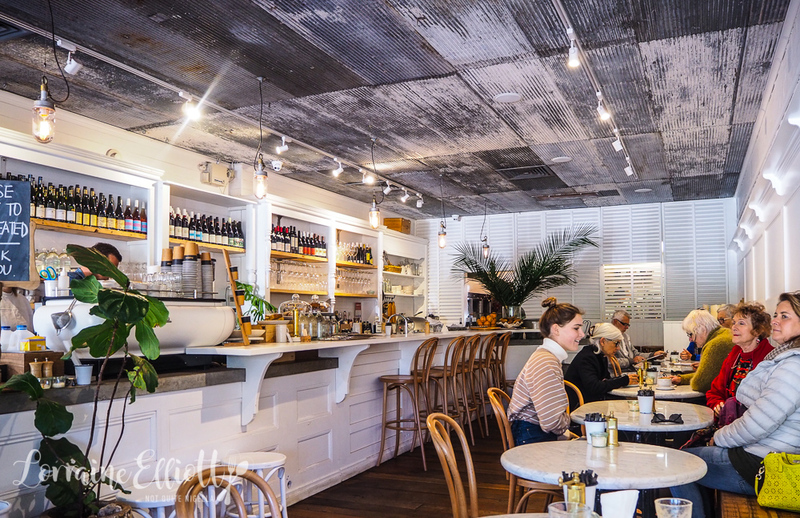 Silica is owned by chef Luke Basic and John Cappellin. Some of the menu's produce is grown on their own plot at Dapto Community Farm. 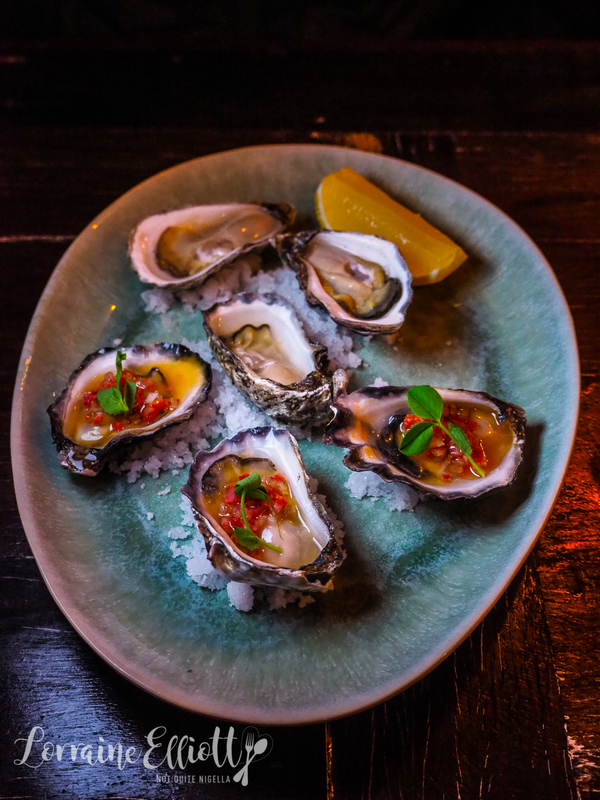 We share half a dozen oysters, 3 natural and 3 topped with chorizo, eschallot and sherry vinegar. They're both good and I like the fact that the chorizo ones are raw oysters still underneath. 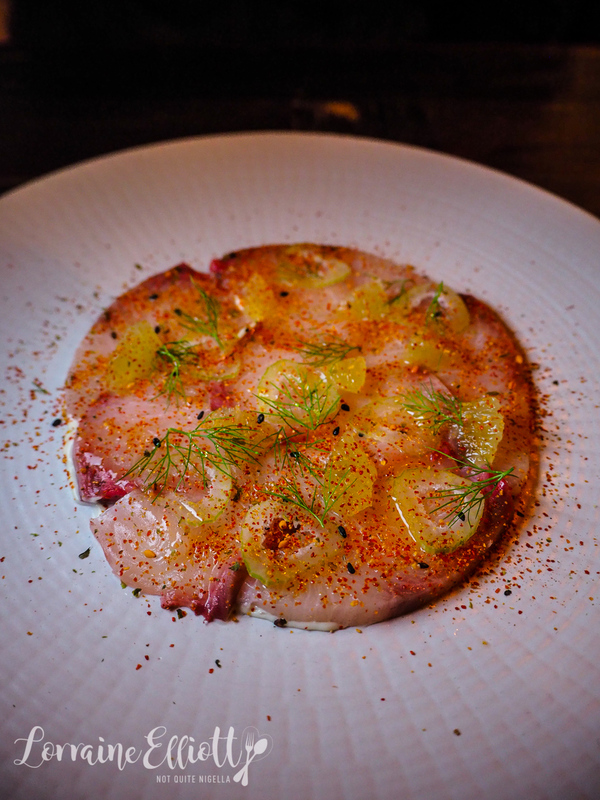 The kingfish sashimi is served with lime segments, kewpie, togarashi and fennel and it's spicy fresh. 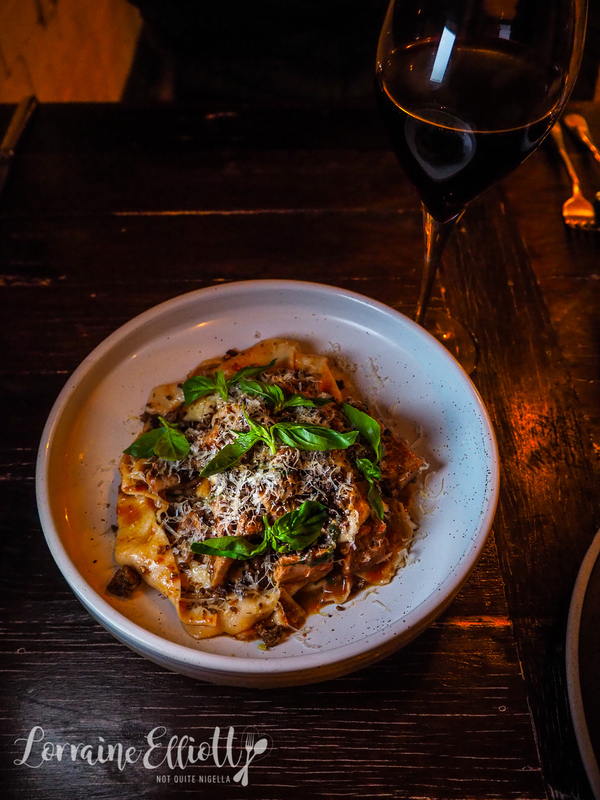 The pappardelle comes with a soft braised pork belly ragu with pangritata and basil which is generous with ragu and soft, melting meat. I like my pasta a bit more al dente. 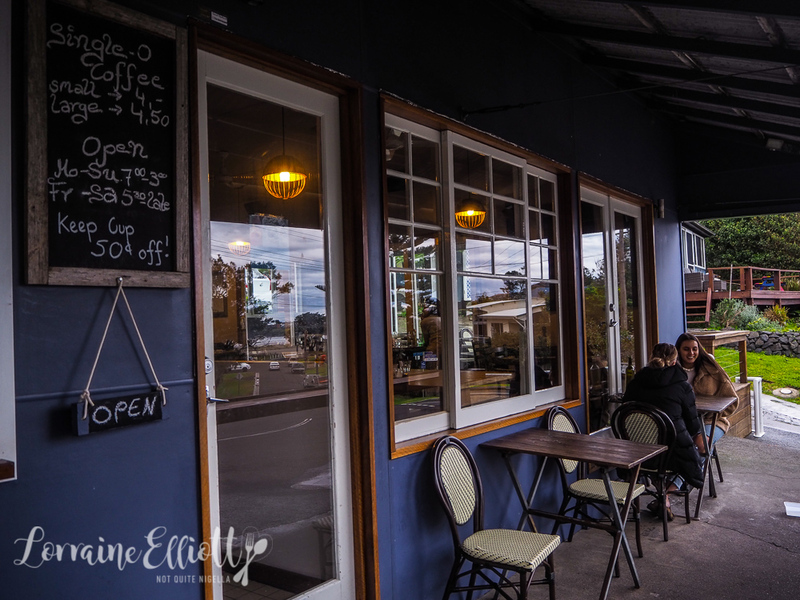 They serve the pappardelle with a fantastic Serra Vista Shiraz Cabernet 2016. I rarely order chicken when out but this was my favourite dish of the night. 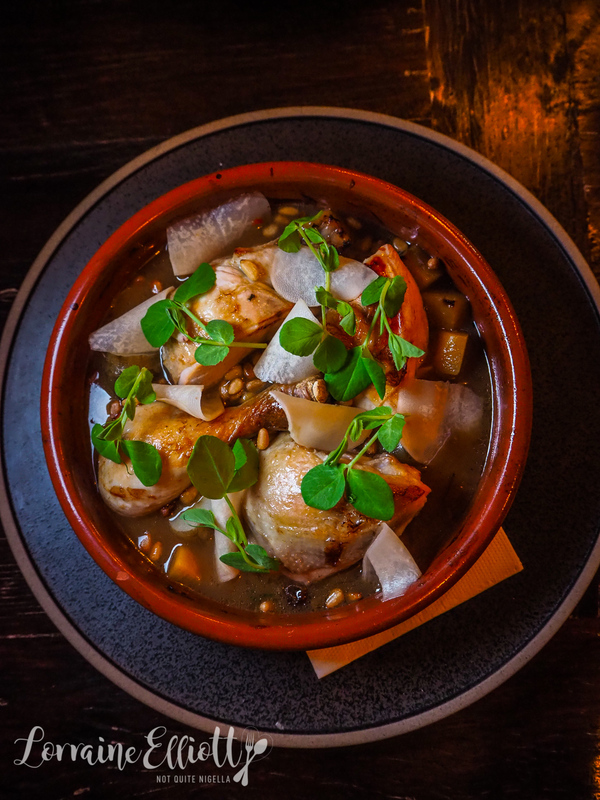 It's braised free range chicken with swede, sage, pine nuts, sultanas, pickled kohlrabi with a rich stock. The fried potato skins are from the pasta night menu. 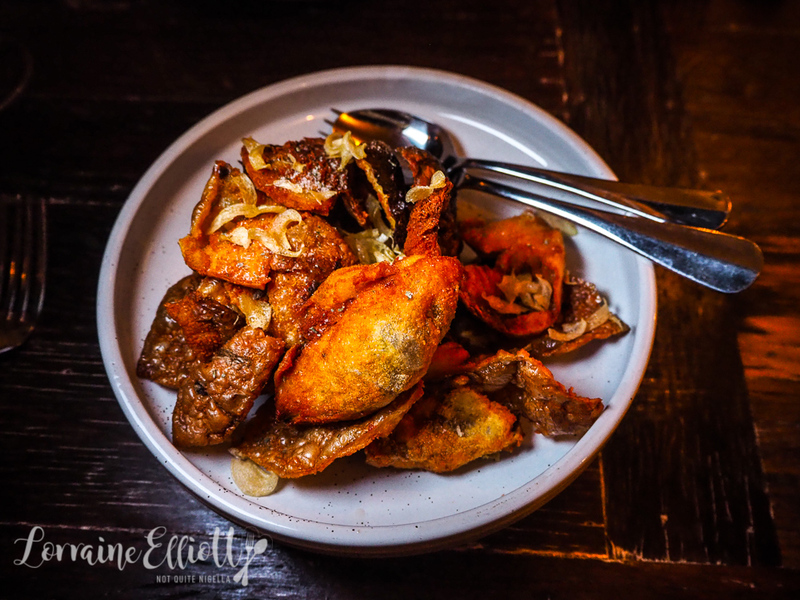 They come out as an enormous serve, super crispy and spiced. 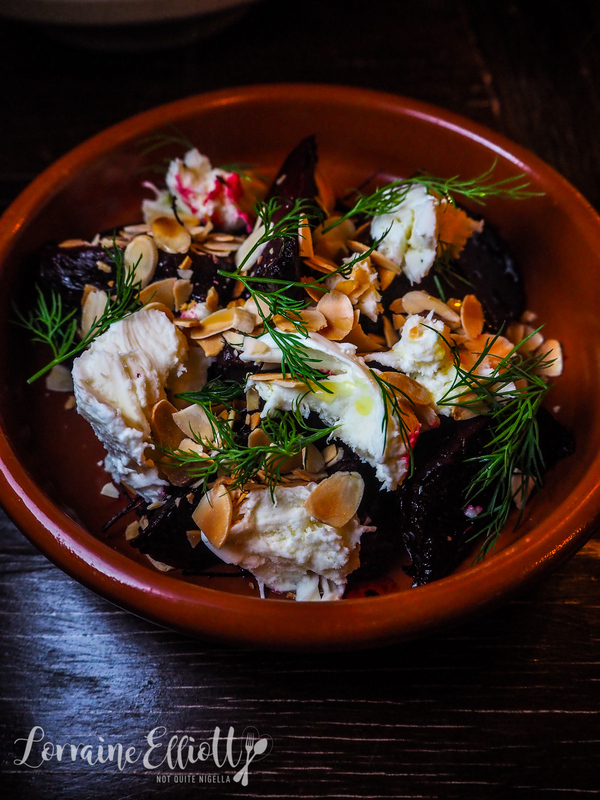 We both really enjoy the sweet roasted beetroot with torn buffalo mozzarella, toasted almonds and dill. This too comes out as a generous portion. 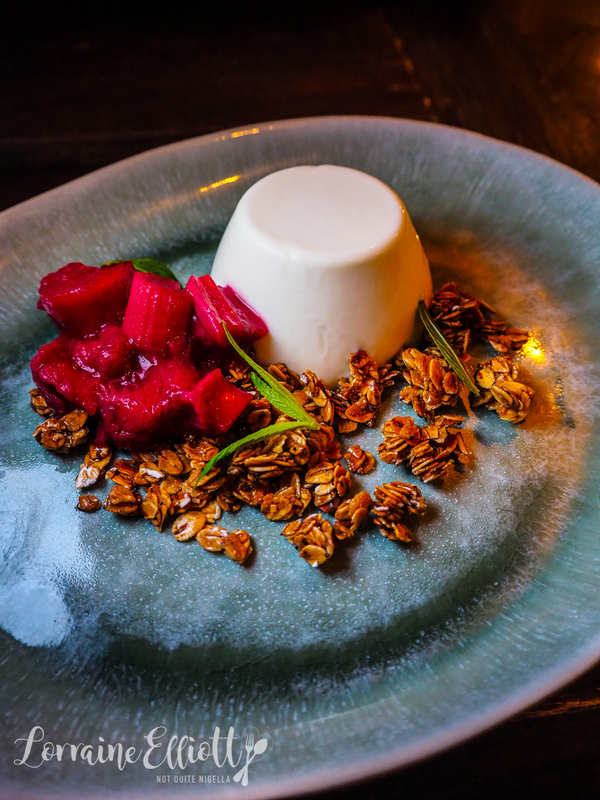 The yogurt panna cotta is so wobbly it's amazing that it managed to be plated. It is served with rhubarb and crunchy burnt honey oats. The next morning we head off for breakfast and wine tasting in Berry. 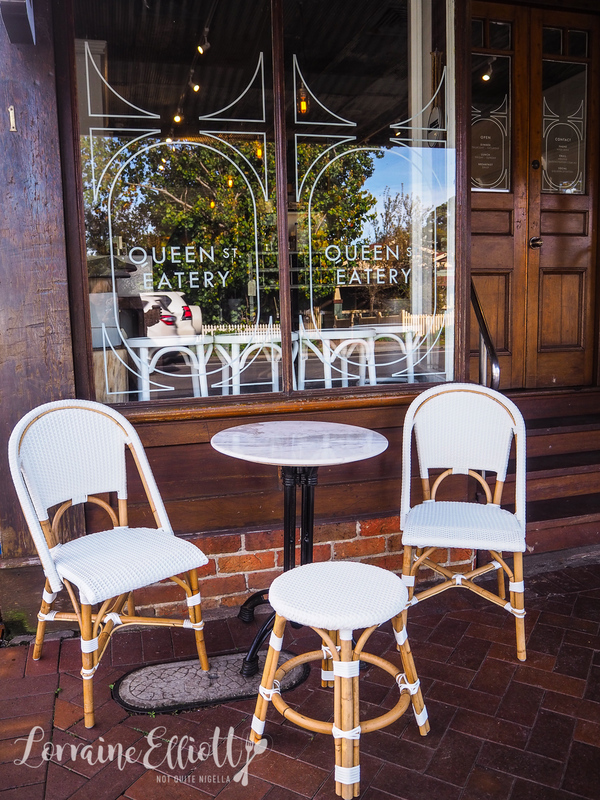 Queen Street Eatery is a relatively new place that specialises in more lunch and dinner. The offering is mainly French and there is a new outside terrace area. 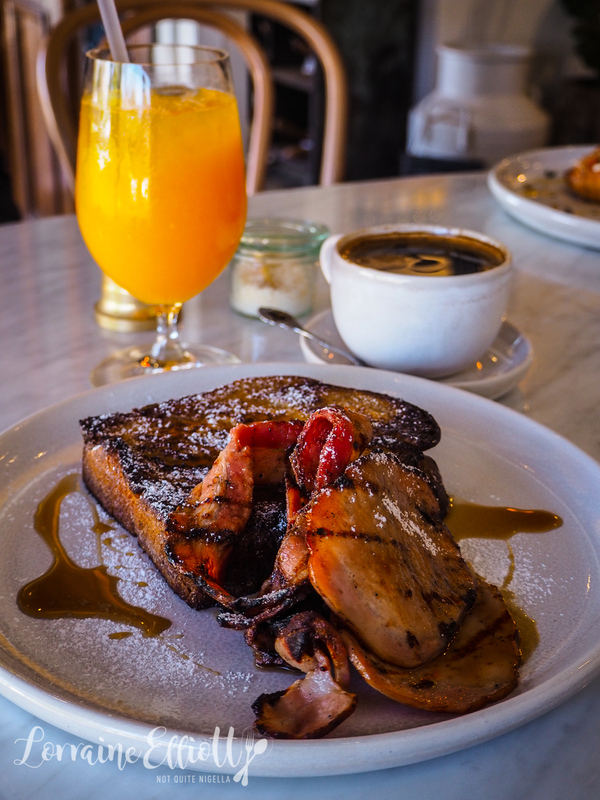 There is an all day breakfast with a gorgeous French toast with a choice of either bacon and maple syrup or seasonal fruit and cream. We go for the bacon and maple syrup. The thick slab of brioche bread is wonderfully buttery and there is a generous amount of bacon. The maple syrup used is no ordinary maple syrup, it's a barrel aged maple syrup by Canadian brand Noble and is deliciously thick and syrupy. 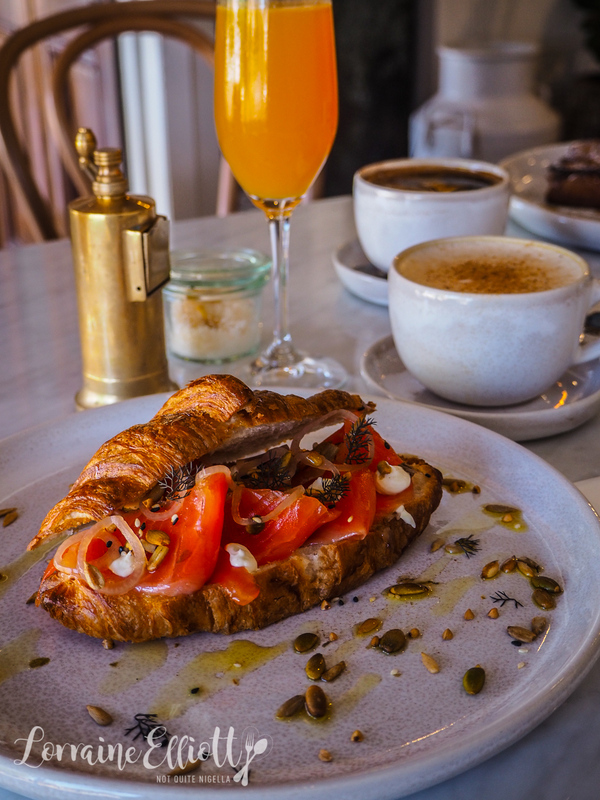 There are three different fillings for the croissant on offer and we go for the house cured ocean trout with pickled onion, creme fraiche and bronzed fennel with pumpkin seeds. We pair it with a mimosa because it feels like a Saturday with the sun shining down and we are sitting in the light filled window. 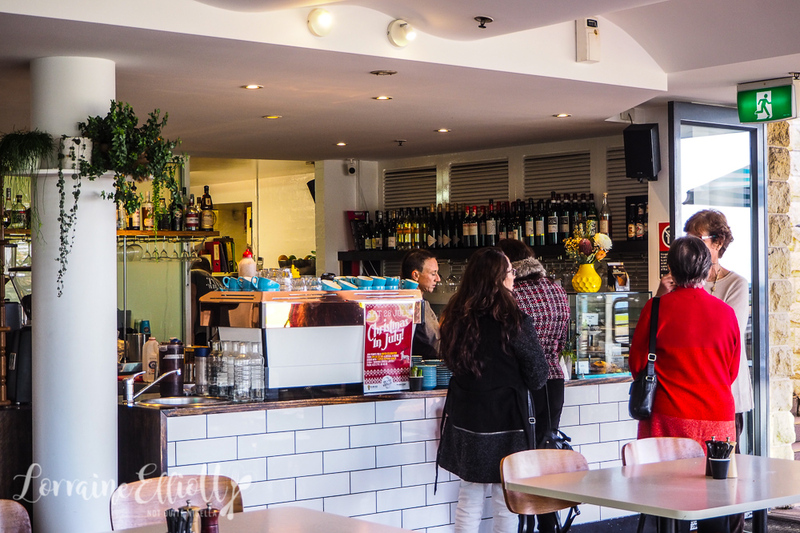 As we are there at the time of the brunch/lunch crossover, we also try a few of their lunch offerings. 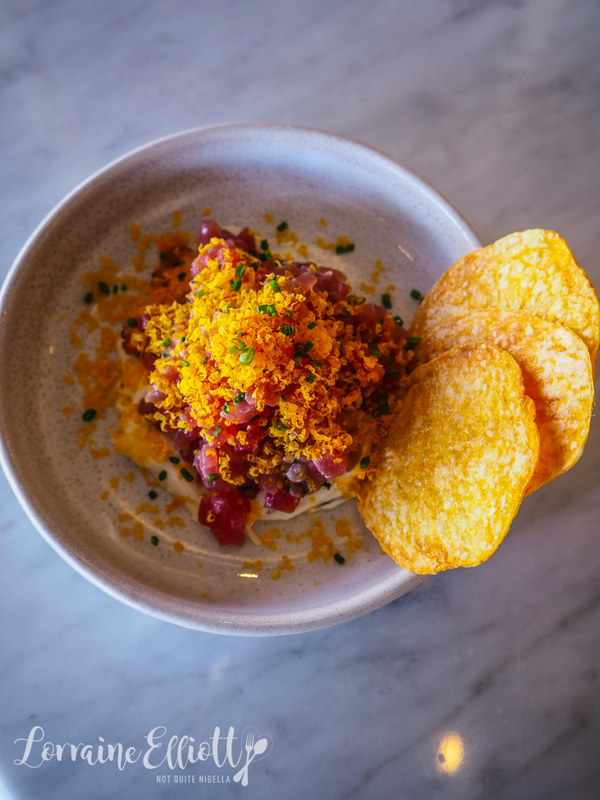 The tuna tartare is a starter with a generous amount of chopped, raw tuna with a creamy celeriac remoulade, cured egg yolk grated on top and crispy pommes gaufrettes that we scoop the tuna on top of. 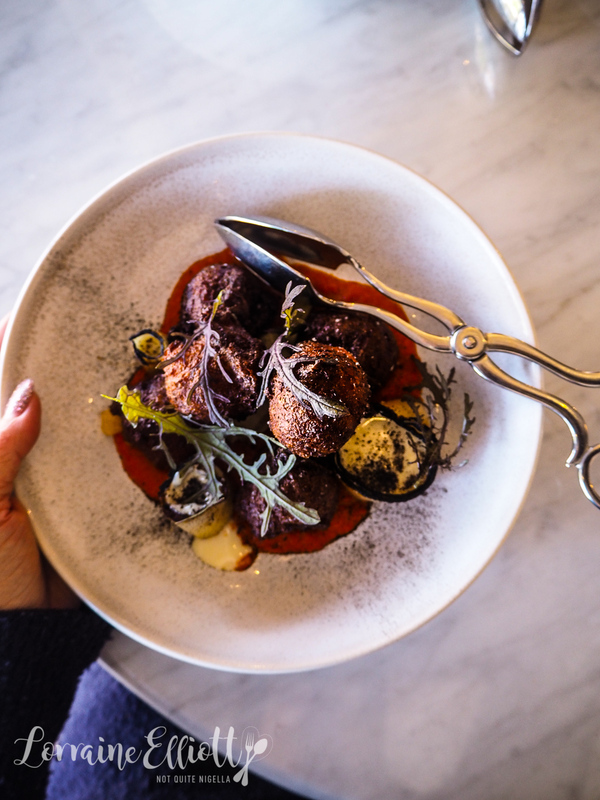 The light as air potato beignets are actually a vegan dish - the chef is vegan and this is packed full of flavour from the rouille and charred leek with creamy vegan sauce. 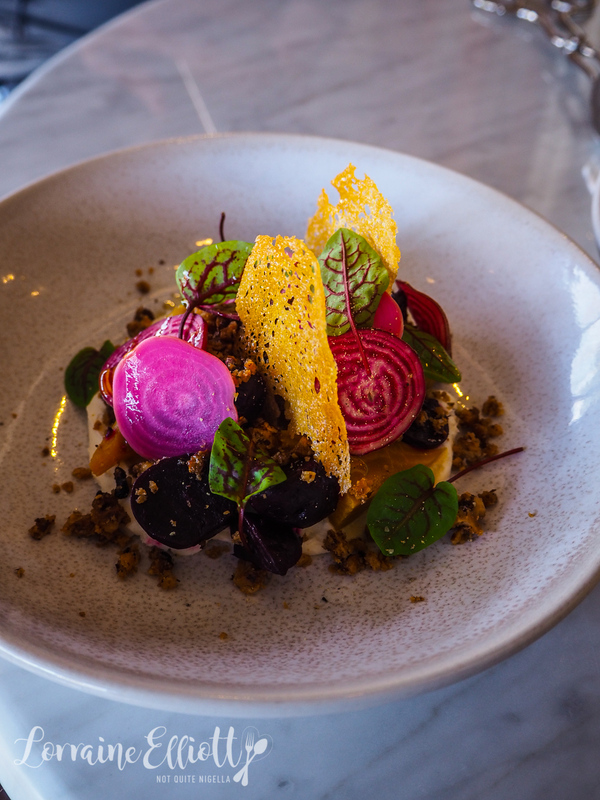 Another lunch time standout dish is the heirloom beetroots with oven roasted, pickled and raw target, pink and yellow beetroots on fluffy goats curd with a crunchy toasted walnut crumb. 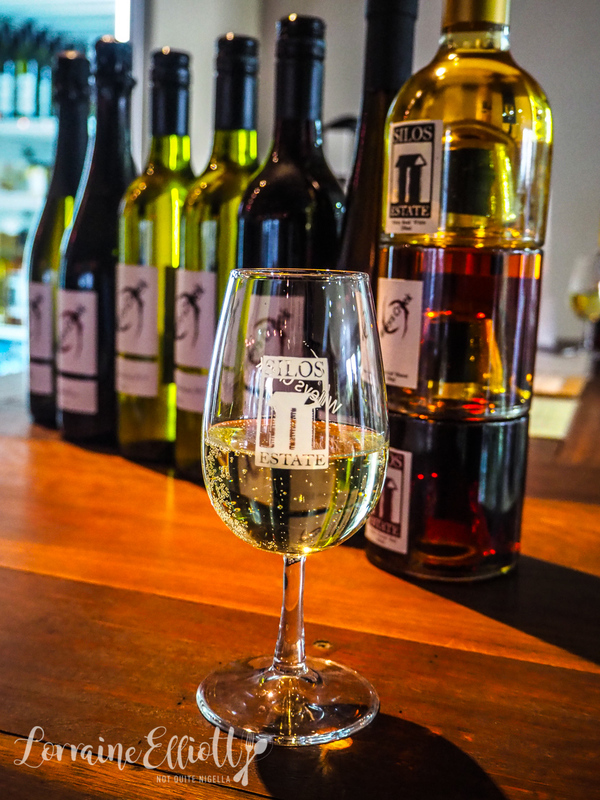 Our next stop is a wine tasting at Silos Estate. Here former CEO turned winemaker Rajarshi Ray and litigator wife Sophie own a winery with a difference. "I'm a capitalist with a social agenda," Raj says. 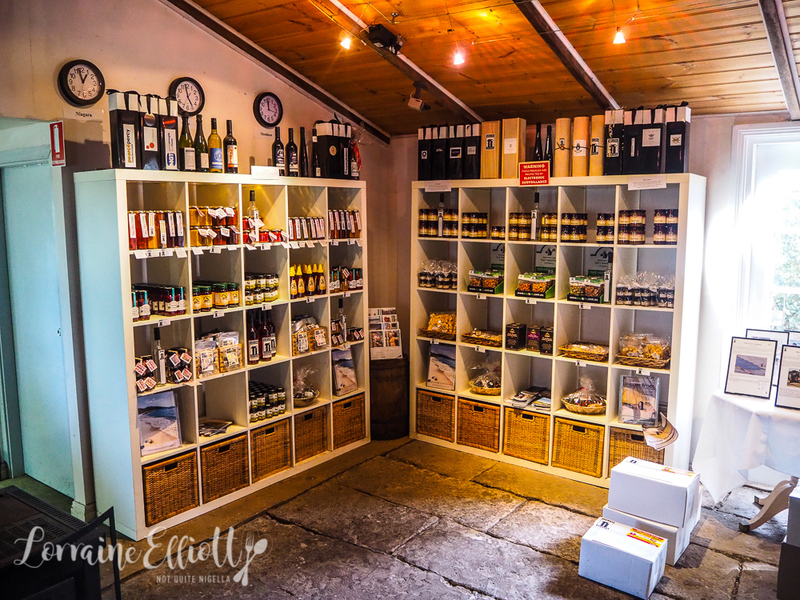 After working 100 hour weeks in the financial sector all around the world they decided to settle in Berry and produce wine. Raj is passionate and engaging and you can see how his practical decision making has informed the farm's offering. 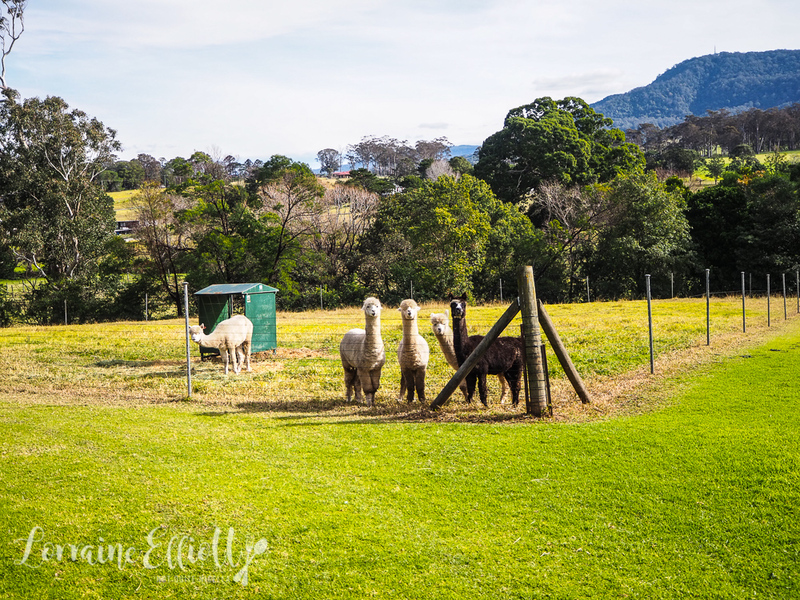 There is an electric car charging station, they are carbon neutral and fully solar powered and the choice of alpaca is an environmental one. Yet most of the money that the winery makes through their wines actually goes back to charity. They support three charities: an overseas landmine charity, a domestic violence charity and an animal charity. I ask him what percentage of profits will go to charity and he answers laughing, "About 150%". 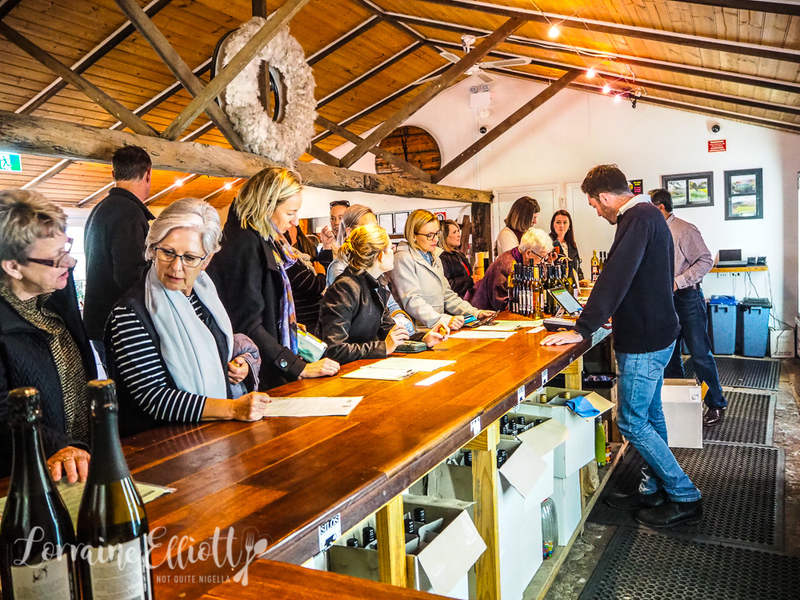 The $5 fee for the wine tasting gets everyone a cork and the customer puts the cork into the jar for the charity they want to support. Afterwards each cork contributes $5 to that particular charity. The actual wine is fantastic, especially the 2017 Rose and the Sauvignon Blanc. 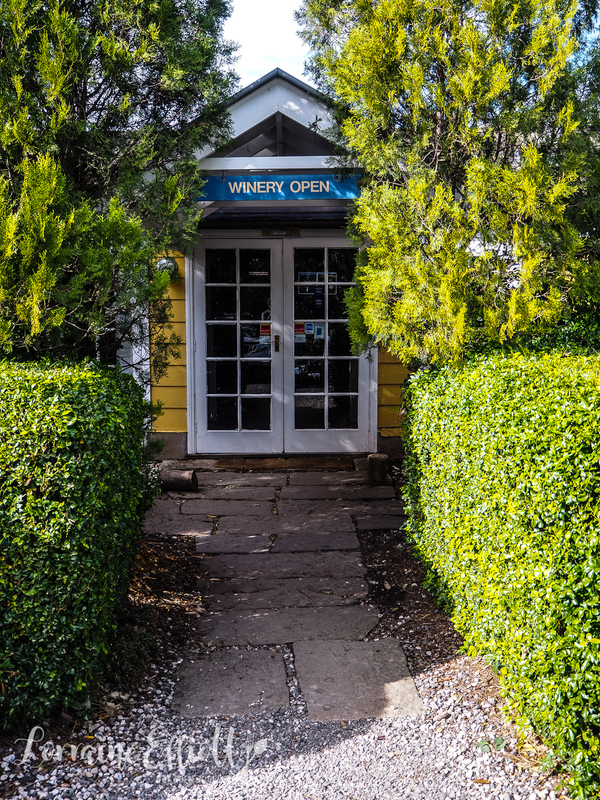 Berry is not seen as a place that can grow Sauvignon Blanc grapes but on the property they have a 2-3 acre island that is cool enough to grow Sauvignon Blanc grapes. They bottle under two labels: Silos which is made using grapes grown on the property and Wiley's Creek where grapes are grown in other areas. And we have one final treat while here: feeding the alpacas. And if you fall in love with these gorgeous creatures you can also buy them from Silos! 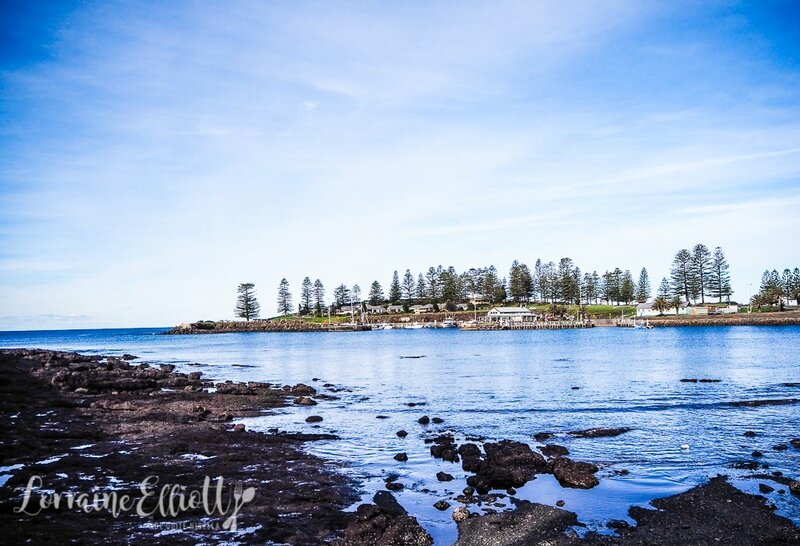 Late lunch is back at Kiama at Penny Whistler's a new cafe with a stunning view of the water and super friendly service. In the near distance we see a pod of dolphins swimming. We start with drinks. 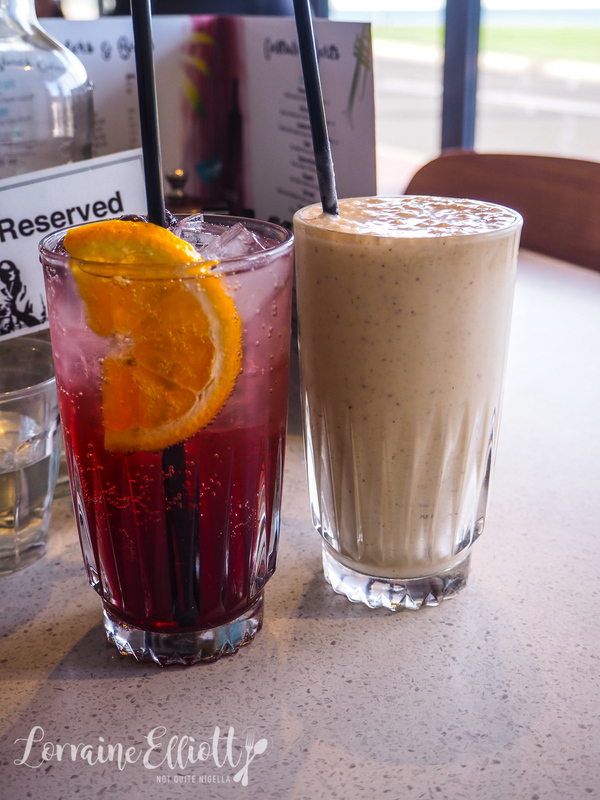 I go for an Egyptian iced tea which is a house made sparkling iced tea with hibiscus, rose and blueberries. It tastes like Turkish delight mixed with berries and is very refreshing. Mr NQN's pick is the banana and peanut butter smoothie which is made with organic almond milk, banana, peanut butter, LSA and honey. It's got just the right amount of peanut butter and sweetness and the almond milk tastes just like regular. For lunch we went for two bowls. 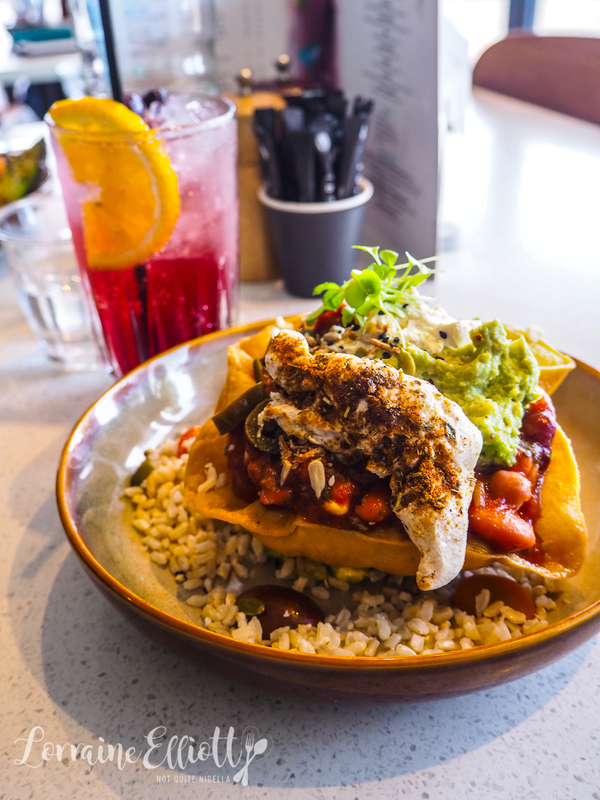 The tostada bowl is a colourful bowl with smoked sweet corn, black bean & tomato salsa, crushed avocado, steamed brown rice, grilled chicken, chipotle sour cream and jalapeños on a crispy corn tortilla. It's a great mix of flavours and textures and Mr NQN makes quick work of this. You really wouldn't believe that he has already eaten breakfast and lunch already. I rarely find a green bowl that I like because I'm not that healthy eater that enjoys being punished over breakfast but the waiter that sold it to me on the fact that he too was not a healthy eater (we have to stick together). 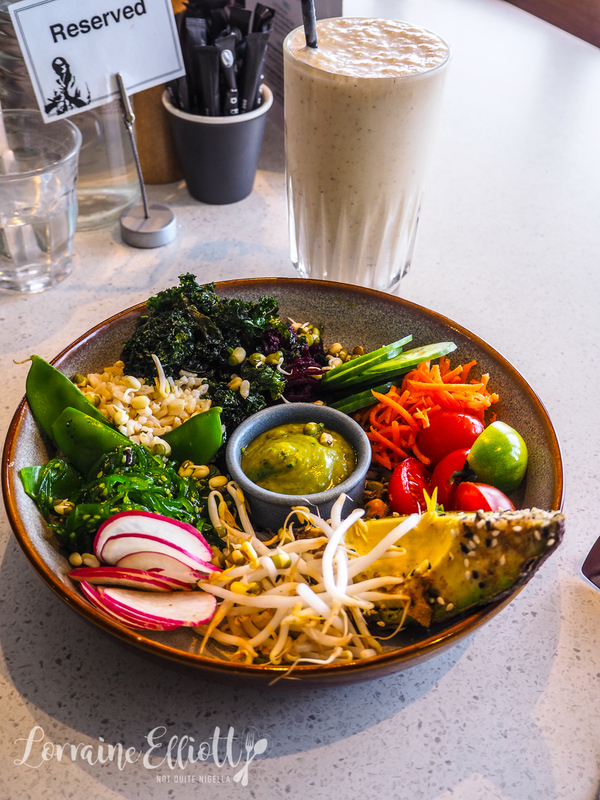 It's crispy kale, dukkah coated avocado half, steamed brown rice, beetroot relish, sprouts, heirloom tomatoes, snow peas, cucumber rounds, Japanese seaweed salad, pickled carrot and green goddess dressing. You can add halloumi, eggs, smoked salmon but we had it as it was and it was actually really good. I feel like the key to these bowls is to not make it too virtuous. 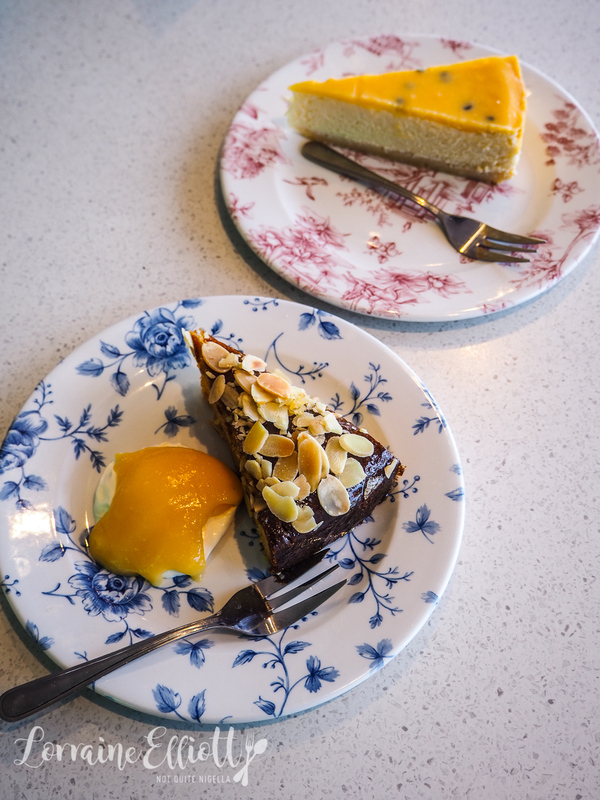 We can't resist and order a couple of cakes. The passionfruit curd cheesecake is creamy and moreish with a lovely biscuit base and a blanket of passionfruit curd on top. I especially liked it with the Greek yogurt and lemon curd that came with the cake below. The lemon almond cake is moist in texture and topped with flaked almonds. It's judiciously served with a generous dollop of natural yoghurt and lemon curd. And then it's onto our next destination! So tell me Dear Reader, are you usually the driver or a passenger during road trips? Do you have any tips for building fires in a fireplace? Have you ever fed or pet an alpaca?